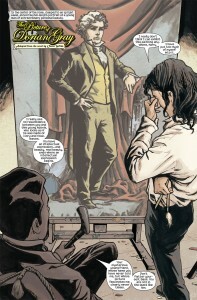 Image taken from Marvel Page about Marvel Illustrated: The Picture of Dorian Gray. Can be found here. For my Oscar Wilde Seminar this semester I’ve been working on an essay that deals with an interesting concept; adaptation. In my essay, I look at the Marvel Illustrated: The Picture of Dorian Gray with the aim of evaluating its effectiveness as an adaptation. One of the points that has been really fascinating to think about however has been the question of authorship. A graphic novel is a text that has many contributors to get it off the ground and make it into an effective vessel for narrative. If there are many people contributing to the creation of the narrative and the artifact that conveys it who then do we call the author? All of them? None of them? Is Wilde still the only author? First lets consider some of the hands that go into producing a graphic novel: we’ve got a “writer”, an “artist”, a “colorist”, a “letterer” and one or more “editors”. Ok so of this list let’s remove the editors, they don’t really go into “producing” the narrative they really are more involved in the process of “refining” it. Now For this particular text this leaves the writer: Roy Thomas, the artist: Sebastian Fiumara, The colorist: Giulia Brusco, and the letterer: Dave Sharpe. Each of these individuals contributes to the way a reader experiences the adaptation of The Picture of Dorian Gray. However, does that really let us say that they are authors in their own right? Thomas is the adaptive writer; it’s his job to take Wilde’s initial text and generate from it a version that is usable in comic form. 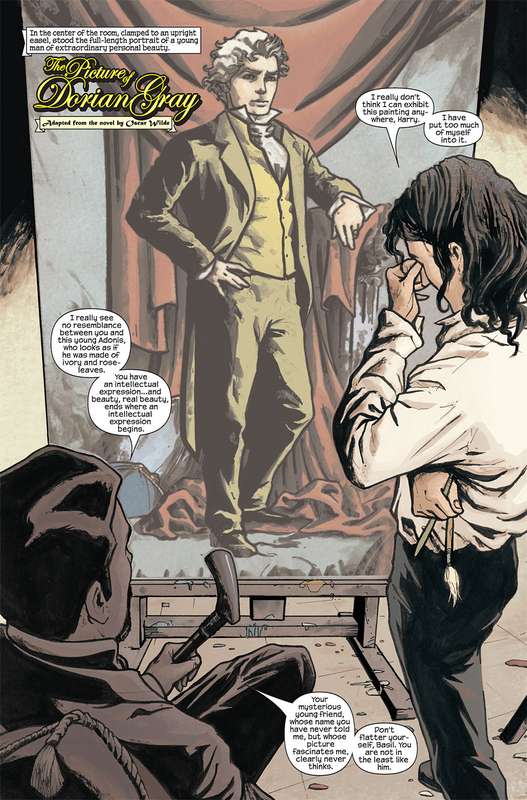 In the introduction to the trade hardback of Marvel Illustrated: The Picture of Dorian Gray Thomas states that the “aim was to tell Wilde’s story, in the author’s own words wherever possible.” Thomas set out not to retell Wilde’s story but rather to adapt what existed into a form that was readily usable in the comic form. This resulted in the truncation of many of the longer philosophical dialogs but still, Thomas added very little “text” to Wilde’s initial work while converting it into a form that allowed the rest of the team to build a comic around it. Fiumara, Brusco and Sharpe have created a brilliant and aesthetically pleasing comic experience. Fiumara’s depictions of the Characters and settings are magnificent. Further, he utilizes excellent positioning, body langue, facial expressions and shading to maximize the impact of each panel of the work. Brusco takes the foundations laid down by Fiumara’s art and builds it into an even richer world, she very effectively utilizes color and shading to increase the effect of key moments and in several effective places to convey time. However, a comic isn’t just the pictures, it’s also about the words. To that end Sharpe has very effectively rendered Thomas’s and Wilde’s text onto the page in such a way that it seamlessly integrates with the story and can be used to generate an effect all its own. It is because all of these contributions go into a readers appreciation and experience of reading this comic text that we must ask the question of “Authorship”. I personally feel that the story of Dorian Gray, belongs to Wilde. It is his work. However, this adaptation isn’t just Wilde’s Dorian anymore. The story is no longer simply told through the words of Oscar Wilde. We must understand that by creating pictorial images that replace Wilde’s textual ones and through the act of utilizing these new images to share in the burden of conveying the narrative of Dorian Gray. The comic team has contributed to the “writing” of the story. Further Thomas has truncated Wilde’s original text in places, and added text to the work that wasn’t there before. He has contributed new ideas within this new text that are relied upon to convey the story in this comic incarnation of The Picture of Dorian Gray. Because these additions, these alterations and transformations are essential to how a reader would experience the new text I think its safe to say that they should be considered to have authorship. Just as we would say that a director who rendered Wilde’s original narrative into a motion picture had ownership of it as its own thing. So to should we consider this work as belonging to those who have helped render it into this new form. This is not to say that I would discount Wilde and his ownership over the original narrative, quite the contrary in fact. I would say that this comic text is a multi-author text, one in which the original work of Oscar Wilde is an absolutely essential component. But I’m willing to debate that, so what do you think?